Even at the venerable age of 90, Noam Chomsky remains the most influential left-wing intellectual alive today. Precisely because of this unparalleled influence, in both politics and science, Chomsky’s life and work deserve not only our appreciation and celebration but also our critical understanding. Consequently, in all that I have written, I have tried to avoid the extremes of hagiography on the one hand, denunciation on the other, in search of a more balanced historical account. Although I am keen to take up each of Chomsky’s extraordinary accusations one by one, I imagine some readers will be getting exasperated by all this. So let me set aside scholarly refutation for the moment and refer anyone who is interested to the Appendix, where I detail some of the paradoxes of Chomsky’s early scientific work and its funding by the US military. I really can’t understand why we are arguing about this particular issue. As I explain in my book, Decoding Chomsky, the supreme paradox of Noam Chomsky is that throughout much of his career, he has been the world’s leading anti-militarist activist while being employed in the world’s leading centre of military research. I don’t see anything wrong with this. Far from it: I see Chomsky’s achievement in withstanding intense institutional pressure as in many respects a model for all of us who have no choice but to try to make our way in a capitalist world. Most of us on the left are compelled to earn a living in some corporation, institution or business not of our design, aware that our work may have anti-social implications even as we attempt to hold our heads high. I am genuinely puzzled why Chomsky should want to claim that none of this applies to him. It surely makes no sense for him to downplay the fact that MIT focuses heavily on war research. Everyone knows that this is true. Chomsky has said so himself. As he told a TV audience in 1970: ‘MIT is a major institution of war research’. Chomsky was an instinctive anti-militarist operating in one of the world’s foremost centres of military research. My intention throughout has been to bring out the ramifications of this basic tension. On the one hand, Chomsky’s novel version of linguistics was officially supposed to lead to military applications; on the other hand, Chomsky always had other ideas. He needed to maintain his principles, no matter what was going on all around him. I can easily understand why, under such circumstances, he prefers to see the positive in the many colleagues who so consistently supported him at MIT. In the same vein, I can fully appreciate his longing to rise above the swamp of military calculations and funding applications, focusing instead on the beauty of mathematical formulae, of previously unsuspected eternal linguistic truths. For Chomsky, the subject of linguistics – language – was never part of the messy, corrupted world of human social negotiation, personal ambition and politics. As an aspect of the natural world it seemed to him to transcend such things. For Chomsky, language is pure mental form. I can understand the attraction of a model of language which sets it free from the world, from social usage, from contested meanings and from the limitations of the physical body. It can seem inspiring precisely because it lifts the mind above worldly concerns. Chomsky’s aim was to bring to light the detailed properties of Universal Grammar, the grammar of grammars. It was an inspiring and ambitious idea, well worth trying out. But in the end, as might have been expected, the project simply did not work. Let me begin with Jerome Wiesner, the highly influential military scientist who, as laboratory director, provost and president, was Chomsky’s manager (in my essay I used the term ‘boss’) at MIT for over 20 years. Professor Wiesner was an important figure in the development of US defence policy in the 1950s. One of his achievements was his 1957 contribution to the potent myth of a ‘missile gap’ which supposedly left the US lagging dangerously behind the Soviet Union. In his reply to me, Chomsky claims that ‘Wiesner’s role was so slight that he is not even mentioned in authoritative insider accounts of the missile gap.’ Reversing my point, Chomsky insists that Wiesner, in fact, urged disarmament while informing the Kennedy administration that the ‘missile gap’ between the Soviet Union and the US was a myth. I helped get the United States ballistic missile program established in the face of strong opposition. I recall Jerome Wiesner and I estimating that [the Soviets] could produce 1000s of ICBM’s in the next few years and urging that the Gaither Committee [of President Eisenhower] base its conclusions and recommendations on that fact. A decade later, Wiesner himself confirmed this account in a speech during which he referred to the fiction of a ‘missile gap’ as a narrative ‘which, in fact, I helped invent’. So Wiesner himself admitted that he had been a principal architect of the whole myth of a missile gap. Chomsky can make his case against me only by dismissing Wiesner’s own words. Kennedy now authorised what Chomsky himself has described as ‘the biggest military increase in history’. By this point, as I said in my book chapter, Wiesner was already beginning to question the unrestrained stockpiling of nuclear weapons. But his concerns didn’t prevent him from helping to oversee Kennedy’s build-up. Nor did they prevent him from administering laboratories at MIT that were working on even more sophisticated missile systems. Radar and bomb guidance developed at MIT aided the bombing of Vietnam. Chomsky’s tireless activism in opposition to the Vietnam War is well-known. At no point have I ever tried to play this down. But it is unclear to me why Chomsky should wish to portray Wiesner in such a positive light given his key initiating role in the development of what became known as the McNamara barrier. The fragmentation anti-personnel bombs, like the BLU/63, which breaks into dozens of jagged fragments, are larger and calculated to do far more damage than the steel ball-bearing pellets. Similarly, flechettes are tiny steel arrows with larger fins on one end which peel off the outer flesh as they enter the body, enlarge the wound, and shred the internal organs. Much of the research for the McNamara barrier was organised at an offshoot of MIT called the MITRE Corporation. Despite his consultancy work for MITRE, which I will discuss later, Chomsky may have been unaware of the corporation’s precise role in Vietnam. But, as an editor of Volume 5 of the Pentagon Papers, he can hardly have missed the part played by his own boss, Wiesner, in the development of the McNamara barrier. Now let me come to one of the more surprising of Chomsky’s mirror-image reversals of reality. Gordon Macdonald was another leading scientist who played an important role in the creation of the McNamara barrier. He had worked for MIT in the 1950s and for MITRE from the 1960s. In Chomsky’s view, this ‘Vietnam War protestor’ deserves our gratitude for having been one of the first scientists to warn humanity about the dangers of global warming, setting alarm bells ringing as early as the 1970s. As always, there is a grain of truth in Chomsky’s account. But, if we look more closely at our sources, we find again that the picture is more nuanced. First, Chomsky appears to have misread his own source, a 2018 New York Times article, from which he mistakenly concludes that MacDonald was himself a ‘Vietnam War protestor’. In fact, this article points out that a group of protestors actually ‘set MacDonald’s garage on fire’ in anger at his involvement with the notorious McNamara barrier. Second, Macdonald made his initial findings about global warming while investigating ways to manipulate the weather for US military advantage in Vietnam and elsewhere. Among other ingenious projects, Macdonald investigated ways to destroy the ozone layer in order to expose enemy territory to radiation levels that would be ‘fatal to all life’. Beginning in 1980, Deutch took part in a classified Defense Science Board study on ‘chemical warfare and biological defense,’ and in 1984, Deutch chaired another DSB task force on the same subject. Deutch acknowledged that in that time period he had alerted the chairmen of the [MIT] chemistry department and applied biological sciences department to available army contracts for mycotoxin research. He said he sees nothing inappropriate with that action. Scientists in chemistry and the applied biological sciences at MIT received $1.6 million from the army to conduct basic research in toxins that could be used in biological warfare. Two years ago, the Pentagon’s Defense Science Board, chaired by John Deutch of the Massachusetts Institute of Technology, recommended a start on the production of binary [nerve gas] weapons and that the Department of Defense should prepare for a major increase in its chemical warfare programmes. I hope that makes the point about the sort of science that Deutch was involved with. For me, however, the really interesting issue is not the precise role played by Chomsky’s colleagues in the development of the Pentagon’s state-of-the-art weaponry. What intrigues me is the passion with which Noam rushes to defend these colleagues, as if their research priorities were not military at all but were somehow compatible with his own anti-militarist commitments. To shed light on this puzzle, we need to take a look at Noam’s early career at both MIT and MITRE. I was in a military lab. If you take a look at my early publications, they all say something about Air Force, Navy, and so on, because I was in a military lab, the Research Lab for Electronics. We sponsored linguistic research in order to learn how to build command and control systems that could understand English queries directly. Linguists and programmers involved in language-based retrieval systems all around the country, including Simmons’s team at SDC, were paying close attention to Chomsky’s work and sometimes used Chomsky as a consultant. MITRE’s principal job is the design and development of more effective military command and control systems. MITRE’s prime mission is to design, develop, and help put into operation global command and control systems that give our military commanders extra time for decision and action in case of enemy attack. MITRE’s prime mission: To design, develop and help put into operation global command and control systems for national defense. By the time these documents were published in 1963, Chomsky’s boss, Jerome Wiesner, had already played an important role in helping to set up the Pentagon’s command and control systems for nuclear war. He had also co-founded MIT’s linguistics department – a department that provided as many as ten trained linguists for MITRE’s command and control research. At least two of Chomsky’s students, Jay Keyser and Bruce Fraser, were also officers in the US Air Force. Now, at first sight, Keyser’s work on ‘Old English Metrics’ appears to have no military relevance and certainly any such relevance would have been indirect. But the Air Force was explicitly interested in English, since they hoped one day to be able to use their own language when giving instructions to their computer-controlled weapons systems. It seemed clear that Chomsky’s ideas about transformational grammar meant studying not just one historical form of English but a wide range of variants in order to work out the underlying grammar. If this quasi-mathematical grammar turned out to be computationally workable, then the Air Force’s computers could be programmed with this grammar. Once this is understood, it is plain to see why research into Old English was entirely consistent with the dream of discovering an underlying grammar that would allow English to be used as the Air Force’s preferred control language. Of course, it was also vital to study the widest variety of other languages in order to discover any underlying universal grammar which the Pentagon might find useful in the longer term. On a rather minor point, Chomsky is quite right to point out my incorrect description of Keyser as a colonel rather than a lieutenant. I am mystified how that particular gremlin crept into a footnote in the version we sent him and I don’t blame him for making the most of it. But you only have to read Lieutenant Keyser’s 1965 report for the MITRE Corporation to appreciate why the Air Force imagined Chomsky’s insights to be relevant to their specific concerns. The bomber the fighter attacked landed safely. In his response to me, Chomsky is silent about the actual content of Keyser’s report, just as he says nothing about the various other documents showing that the Air Force expected that his linguistic theories would indeed prove useful for weapons command and control. … in the event of a nuclear war, the generals would be underground with some computers trying to manage things, and that it would probably be easier to teach computers to understand English than to teach the generals to program. The use of MIT’s linguistic research for ‘command language’ was only one aspect of MITRE’s project. Documents show that the corporation were also hoping to use this research for what they called a ‘military information system’. And, by 1965, MITRE’s researchers claimed to have created a ‘transformational grammar’ for ‘accessing data from military planning files’. I doubt whether such a grammar was of any practical use considering that, as it turned out, none of Chomsky’s theories actually worked. As I have often pointed out, Chomsky wasn’t interested in any practical applications, military or otherwise. In that sense, I have serious doubts whether he cared too much whether his theories worked at all. For a while, the Air Force was convinced that supporting pure research in generative grammar was a national priority, and we all tried to convince ourselves that taking Air Force money for such purposes was consistent with our consciences, possibly even a benign subversion of the military-industrial complex. In other words, this group of young researchers really wanted to believe that they were somehow tricking the Pentagon into investing in linguistics as opposed to developing weapons systems. Yet precisely who was tricking who remains an open question. After all, as long as a reasonable percentage of the research that the Pentagon sponsors ends up being militarily useful, why would the Pentagon care what their researchers thought they were doing? At MITRE you will work closely with the Air Force, and other military organizations. You will be associated with some of America’s most important defense projects, yet you will pursue your assignments in a free and independent scientific environment. This commitment – from a 1962 MITRE recruitment advert – is itself reminiscent of General Eisenhower’s 1946 directive that military scientists ‘must be given the greatest possible freedom to carry out their research’. This whole approach to military research is also consistent with what Wiesner himself termed the ‘anarchy of science’, ‘scientific anarchy’ or ‘planning for anarchy’ – all of which he saw as crucial in order to encourage the ‘free’ environment required for scientific creativity. You could do what you wanted in your personal and political life, and also in your academic and professional life, within a broad range. It must’ve been one of the most free universities in the world. Well, yes. That was precisely how the Pentagon wanted its scientists to feel. To bolster his claims about freedom, Chomsky points out that MIT’s managers were very supportive of him despite his active opposition to the Pentagon. Chomsky does this to suggest that we should see these managers as genuine supporters of political as well as intellectual freedom. But I think it more likely that MIT’s managers followed this policy because they were not stupid. They understood perfectly that had they permitted a purge of any left-leaning academics, then their entire institution – including its war work – would have been undermined. To back up his arguments about political freedom, Chomsky claims that his managers created no problems ‘of any moment at MIT, for me or other activists’. Now, while this may have been true for Chomsky himself, we only have to turn to MIT’s own newspaper, The Tech, to see that when students picketed MIT’s missile laboratories or occupied its administrative offices, these managers soon turned to the police and courts. In 1970, for example, they had two anti-war student activists sent to prison for the supposed crime of ‘disruption of classes’. Then, in 1972, MIT took 30 activists to court for participating in an overnight occupation of military offices in the very same building as Chomsky’s own office. See, when we were standing in the president’s office trying to protect the president’s office from the radical students, I’d look up and I’d be standing right beside Noam Chomsky. Since then, Chomsky’s attitude hasn’t changed. By continuing to downplay what everyone knows about MIT’s military role, he shows once again his commitment to defending his institution. 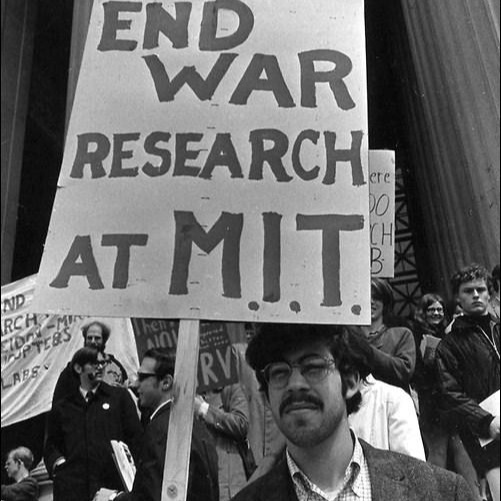 When, in the late 1960s, radical students began demanding an end to war-related research at MIT, Chomsky faced a dilemma. He didn’t want to alienate these radicals, but neither did he want to risk his career at MIT by fully supporting them. Chomsky solved the problem by describing the students’ demand to end all war research as really a right-wing position. It was right-wing, he claimed, because if MIT did end its war research, then that research would just be conducted somewhere else, out of reach of student scrutiny and opposition. Far better, he said, to keep it at MIT where it could be closely watched. This position, he insists, is the only genuinely ‘radical’ or ‘left-wing’ position. And so it was that in May 1969, Chomsky signed the initial version of a report produced by the Pounds Commission, a body which had been set up in response to the growing student protests against war research at MIT. This report recommended that MIT keep all its military laboratories. In October 1969, in an atmosphere of growing student unrest, Chomsky refrained from signing the final Pounds Commission report. But his proposal in an appendix – recommending that MIT’s military labs should ‘be restricted to research on systems of a purely defensive and deterrent character’ – could easily be interpreted in a way that allowed much of MIT’s war work to continue. [We] wanted first and foremost to stop the war research … We didn’t want the war research to go on in divested labs, nor did we want it to go on in affiliated labs. We wanted the war research stopped, period. Unable to support such genuinely radical demands, Chomsky tries to persuade us this didn’t really matter because, in the 1960s, the university ‘did not have war work, war-related work, on the campus.’ By defining most war research as technically ‘off campus’, Chomsky can even make the highly misleading claim that ‘MIT itself doesn’t have war work’. The truth, however, is that any distinction between ‘on campus’ and ‘off campus’ research was little more than a smokescreen to hide MIT’s deep military involvement. As we’ve seen, the whole point of Pentagon funding for basic research ‘on campus’ at MIT was that any theoretical findings could then be developed into functional weaponry at various ‘off campus’ facilities such as the MITRE Corporation or the Draper Laboratories. In 1971, these Draper Laboratories – which specialised in nuclear missiles – produced a report which stated that their research facilities were still ‘an integral part of the academic structure of MIT’. Further illustrating the public relations function of the largely fictional ‘on campus’/’off campus’ distinction, the Pounds Commission report itself cites figures showing that as many as 500 MIT students and academics worked at the Draper and other ‘off campus’ military labs. Chomsky himself signed this particular section of the Pounds Commission report. Long after these events, Chomsky himself has also stated that MIT’s military laboratories ‘were very closely integrated with the Institute’, some being located only ‘two inches off campus’. For well over 50 years, Chomsky has fearlessly exposed and criticised every aspect of the US military machine with one striking exception: its influence on US universities. Far from hiding or downplaying this attitude, Chomsky is on record as saying that whether a university is ‘being directly funded by the CIA or in some other fashion seems to me a marginal question.’ By stressing how free he was at MIT and how distant he was from military research, Chomsky has steered many commentators away from even noticing the paradoxes of his institutional position. In his response to me, one sentence is particularly revealing. Chomsky states that his students at MITRE understood that ‘any imaginable military application [for their linguistics work] would be far in the remote future.’ This apparently innocuous remark is significant for two reasons. First, because it may be the nearest he has ever come to admitting that the Pentagon funded his linguistics in the hope of military applications. And, second, because although his students may have been reassured by the prospect of a lengthy time delay, Chomsky himself would surely not have been so easily placated. After all, if MITRE’s linguistics research had actually succeeded, it could have led to a situation in which whenever a US commander targeted a village in a counter-insurgency operation – or targeted an entire city during a nuclear war – they would be unleashing death and destruction thanks ultimately to Chomsky’s theoretical insights. Under such circumstances, knowing that he had only developed the abstract theory, as opposed to workable applications, would have been of little comfort to someone as principled as Chomsky undoubtedly was. So what could Chomsky do? He was too principled to come up with some convoluted argument about how war research might benefit humanity. That’s the kind of argument that liberal militarists such as Wiesner might have found appealing. Chomsky preferred to keep things simple. He resolved instead, whether consciously or unconsciously, to make all his linguistic theories so utterly abstract that they stood no chance of proving useful for ‘any imaginable military application’ – not even one postponed into the ‘remote future’. Extract from ‘Current Research and Development in Scientific Documentation’, No. 10, 1962, p. 301. In his reply to me, Chomsky denies that there is anything unusually abstract or other-worldly about his models of language. He even claims to be working in the tradition of ‘the great anthropological linguists’, Franz Boas and Edward Sapir, who did so much to advance linguistics during the early twentieth century. These pioneering scholars considered it illegitimate to study a language without simultaneously studying the history and culture of those who spoke it. They believed there was no way to make sense of linguistic forms or associated meanings without being aware of how language was used in the speech community concerned, bearing in mind the mode of subsistence, kinship system, economic relationships, rituals, religious beliefs and so forth. Chomsky’s claim to be working in the tradition of such cultural relativists as Boas and Sapir is jaw-dropping. After all, it was Chomsky who did more than anyone to redefine linguistics completely, disconnecting it from its former home in university anthropology departments. Chomsky is, in fact, the supreme example of a linguist whose methods relentlessly disconnect abstract theory from the realities of social and cultural life. Consistently through all its versions and reincarnations, Chomsky’s concept of Universal Grammar disconnects the human language faculty from the rest of the brain, from speaking and listening, from context and meaning, from communicative usage of any kind, from learning and experience, and finally from culture, history, prehistory and any possible evolutionary precursor in the organic world. In order to understand Chomsky, we must treat him as we would any other intellectual. We should make a sustained effort to view his work in the context of his times, his community’s history and the institutional and political environment in which his ideas took shape. In his 2017 reply to me in the London Review of Books, and again in his more recent response, Chomsky plays back this standard sociological approach of mine in unrecognizably absurd form, almost as if I were claiming a month-by-month correlation between cash receipts from the Pentagon and Chomsky’s latest idea. I can agree with him that had I been distorting his motives in this way, I would deserve the accusations of ‘deceit’ and ‘defamation’ that he hurls in my direction. Among other details which supposedly refute my whole argument, Chomsky points out that his basic philosophical approach is not fundamentally at odds with the one he adopted while still a student. He argues that since his approach to language pre-dated his paid employment at MIT and then remained constant throughout his life, I must be wrong to perceive any intellectual dependency on the ups and downs of Pentagon funding at MIT. But, of course, I am not claiming any such crude dependency or correlation. My point, documented exhaustively in Decoding Chomsky, is that military funding of computers and control systems was a powerful factor influencing the intellectual climate long before Chomsky got his job at MIT in 1955. Chomsky himself has clarified that he and Morris Halle – who was already at MIT – were ‘working together since 1951’. 1951 was also the year when Chomsky formed a close friendship with the Israeli logician Bar-Hillel, who was in charge of all machine translation research at MIT. Even before this, in the 1940s, Chomsky’s first linguistics teacher, Zellig Harris, was already excited by the prospect of automatic language processing including machine translation. All those in Chomsky’s circle were excited by computers in one way or another. Such was the climate of the times. Far from claiming a correlation between funds from the Pentagon and Chomsky’s latest idea, I have always argued the exact opposite – that Chomsky consistently avoided any hint of military collusion. He achieved this by constructing a firewall to protect every aspect of his paradigm, disconnecting linguistic theory from linguistic practice, language from any of its possible uses and pure linguistic science from any conceivable application, whether military or not. This could only be accomplished by pursuing a level of abstraction unprecedented in the history of linguistics. During the early years of his academic career, Chomsky’s linguistic models were relatively rich in detail and in that sense concrete. His most fabled early work, The Logical Structure of Linguistic Theory (1955), featured page after page of quasi-mathematical formulae, each item fully specified, giving the impression of a richly detailed instruction manual for computer engineers. In other early works, Chomsky was perfectly happy to analyse the sound patterns of particular languages, notable examples being his Morphophonemics of Modern Hebrew (1951) and The Sound Pattern of English (1968). Yet as time went on, such relatively concrete studies gave way to contributions whose most striking feature was their unprecedented generality and lack of specific content. In the late 1950s and early 1960s, most of his supporters assumed that Chomsky’s work would help them construct a transformational grammar of any language they chose to study. But these hopes were dashed when Chomsky renounced the very concept of what he termed ‘external’ languages, arguing that the only scientific object of study would henceforth be ‘I-language’ – language conceived as internal to the individual mind. From the standpoint of a scientist on Mars, Chomsky said, only one language existed on Earth. Each locally distinctive sound pattern comprising what had previously been viewed as a speech community’s language was, from this standpoint, no more than an ‘externalization’ of something immeasurably more significant – the one language that all human beings know from birth. It seems clear to me that Chomsky’s attraction for universal and eternal truths was always driven by a felt need to rise above the messiness and temporality of language use and political life. Initially, he was prepared to go along with those of his MIT/MITRE colleagues who imagined that, one day, certain military uses might be found for a transformational grammar of, say, English or Russian. He wouldn’t actively encourage such hopes, but neither did he go out of his way to discourage them. But then came Vietnam, which revealed, as never before, the horrifying levels of death and destruction that modern armies could inflict by harnessing cutting-edge science. It was just as he was getting active on the public stage as a leading opponent of the Vietnam War that he set about distancing himself from those teachers and colleagues – among them Zellig Harris – who had previously introduced him to the science of linguistics. If Chomsky tells me that his linguistics has no significant connection with his moral or political surroundings or ideals, I must respect his insistence on that disconnect. I am well aware that Chomsky has consistently denied any significant connection between his political activism and his science. Paradoxically, however, this only strengthens my case, since my own argument rests on precisely that point. Chomsky is faithful to a venerable intellectual tradition in which form and content, eternal soul and mortal body, linguistic theory and linguistic practice are not required to meet up. From his earliest years right up to the present, Chomsky has always felt most comfortable with models of language so otherworldly and abstract that no one could possibly make use of them for anything at all, let alone for killing people. This suggestion is controversial. But I have come across no better way to explain some of the more incomprehensible and absurd features of Chomsky’s linguistics. Over the centuries, linguists have often adopted an abstract approach to their field. But in Chomsky, abstraction is carried to such an extreme that language is no longer connected with speaking or with social communication, history or culture at all. Chomsky explicitly emphasises this feature of his thinking. ‘Language’, he says, ‘is not properly regarded as a system of communication … [although] it can, of course, be used for communication, as can anything people do – manner of walking or style of clothes or hair, for example’. So, according to Chomsky, language is fundamentally not about communication any more than are your legs, clothes or hair. Just as he disconnects language from communication, Chomsky’s method is to treat a disconnected sentence – for example ‘John is easy to please’ – as an isolated object, to be analysed apart from its conversational use. Criticising this whole approach, the influential linguist Adele Goldberg has described it as ‘akin to studying animals in separate cages in a zoo’ when they should be studied in their natural habitat. The natural habitat of language, she writes, is conversation. Chomsky even disconnects language from evolution. When asked how the biological faculty evolved, he argues that it did not. Instead he suggests that the brain of some ancestor may have been abruptly and suddenly ‘rewired, perhaps by some slight mutation’. From this moment, mysteriously, the brain contained not only Universal Grammar but also specific words. Chomsky makes the extraordinary claim that the lexical concepts we combine in sentences – examples being ‘book’, ‘bureaucrat’ and ‘carburettor’ – are genetically determined items which were installed in the mind of Homo sapiens many thousands of years before actual books, bureaucrats or carburettors had come into existence. Although Chomsky is still respected as the founder of modern theoretical linguistics, the current consensus among linguists is that none of his theoretical models of Universal Grammar has survived the test of time. Again and again, some linguist conducting fieldwork in a remote corner of the world has brought to light a previously unrecognized language which brings Chomsky’s theoretical edifice crashing down. But that hasn’t stopped Chomsky from doing all he can to defend his latest theory. Replying to me, Chomsky invokes in his defence Kenneth Hale, the brilliant linguist employed alongside him at MIT. From Chomsky’s response, you might think that when Hale informed him in 1978 about an unfamiliar language from Aboriginal Australia, the details confirmed Chomsky’s theory of Universal Grammar. Nothing could be further from the truth. Chomsky had argued that any sentence in any language consisted essentially of a noun phrase and a verb phrase. So noun phrases and verb phrases were considered the basic ‘constituents’ of any sentence. With this in mind, the ‘constituent structure’ of a sentence depended on how these basic elements were configured, how they were arranged with respect to one another. In 1978, however, Hale told Chomsky about a language from Aboriginal Australia – Warlpiri – which violated even this most basic constraint. In this hunter-gatherer language, it seemed to make no difference whether a speaker said ‘The man speared the kangaroo’, ‘The kangaroo speared the man’ or strung the words together in any other order. Chomsky had allowed for the fact that languages could differ from one another. But when Hale told Chomsky about Warlpiri, he was concerned that his discovery – or at least his theoretical formulation of it – made ‘languages seem more different than ought to be possible’. In other words, the world’s languages now seemed far more varied than they ought to be if Chomsky’s core assumptions about Universal Grammar were correct. Faced with this problem, Chomsky took some time to elaborate a response. The two colleagues eventually came up with a solution. On Hale’s initiative and with his support, Chomsky suggested that the presence or absence of constituent structure (described as ‘configurationality’) was just an optional ‘setting’ within the recently invented ‘principles and parameters’ model of Universal Grammar. Whatever Universal Grammar’s abstract principles were, ran the argument, their concrete application depended on parameters which could be switched this way or that. Among the newly invented parameters was, Hale suggested, a switch allowing you to turn constituent structure ‘off’ or ‘on’. The beauty of this move was that, from now on, virtually anything could be declared consistent with Universal Grammar simply by inventing this or that optional parameter as required. All this was happening during the late 1970s, some years before Chomsky retreated still further with his ‘Minimalist turn’, when he concluded that Universal Grammar might, after all, involve no genetic constraints at all. Chomsky’s most breathtaking minimalist insight was that the fundamental properties of UG – like those of a snowflake – might reflect something like gravity or surface tension, a ‘natural law’. In 2012, one sympathetic interviewer felt bold enough to ask: ‘What exactly is UG at this stage?’ Chomsky replied: ‘Well, what’s Universal Grammar? It’s anybody’s best theory about what language is at this point. I can make my own guesses’. Summing up decades of intensive work, then, Chomsky can only tell us that the nature of UG is anyone’s guess. In the eyes of most linguists today, the whole concept of Universal Grammar has become so empty of content that it no longer serves any useful purpose at all. As the acclaimed psychologist and linguist Michael Tomasello remarked in 2016, ‘[Chomsky’s] universal grammar appears to have reached a final impasse’. But this still begs the question of why should any of this matter to those of us struggling to build an anti-capitalist movement in the 21st century? Well, Chomsky is still the global left’s most influential living intellectual. The questions he raises are crucial ones. What does it mean to be human? What kind of creatures are we? What is the nature of language and how did it evolve? Chomsky asks all the right questions. They are anthropological ones. But as he disconnects mind from body and theory from practice, he inevitably sets up a stumbling block, preventing us from properly addressing such momentous and important issues. Grammar does not exist, and could not have evolved, in isolation. To understand it we must reconnect it with our social, sexual and political lives – with laughter and song, ritual and play, politics and kinship, not to mention everything else which makes us the human beings we are. For ninety per cent of our existence as a species, we humans were nomadic hunter-gatherers, living long before private property, territorial borders, warfare, despotism or poverty had ever been invented. I have written elsewhere about how our bodies and minds were shaped under the communistic, egalitarian social conditions enjoyed by our hunter-gatherer ancestors. It was under such liberated conditions that we developed the most extraordinarily social of our genetic capacities, our ability to agree on words, construct sentences and by such means share our thoughts and dreams. Successful use of language depends on previous shared understandings, trust in communicative intentions and a willingness to consider our words from the other person’s perspective not just our own. There can be no doubt that these capacities have a genetic basis. There is such a thing as human nature and it is wired into our brains. But this nature is quintessentially social, hence political. Whereas Chomsky’s individualist paradigm relentlessly excludes social functions and dimensions, almost every other linguist or evolutionary anthropologist would agree with me that it is our unique social intelligence which enables language to be endlessly reinvented and creatively used. It is insights like these that have led to a growing scientific interest in the kinds of politics which best promote the flourishing of language and creative thought. Extracts from ‘Grammars of Number Theory Some Examples’ (MITRE Corp. 1963) by Arnold Zwicky. 1. Noam also downplayed MIT’s war research when asked by the New York Times to respond to my book (Sam Tanenhaus, ‘On Being Noam Chomsky’, New York Times, 31 October 2016). For Chomsky’s other responses to my book, see: Tom Bartlett, ‘The Chomsky Puzzle’, The Chronicle of Higher Education, 25 August 2016; Sam Fenn, ‘Chomsky's Carburetor’, Cited Podcast, no. 23, 2016 (http://citedpodcast.com/23-chomskys-carburetor/); Noam Chomsky, ‘Chomsky Says’ and ‘Chomsky has the Last Say’, London Review of Books, vol.39, no.12, 15 June 2017 and no.16, 17 August 2017. Also see note 20 on page 247 of the paperback edition of Decoding Chomsky (2018) for more examples of Noam understating MIT’s involvement in military research. 2. ‘Noam Chomsky and Michel Foucault. Human Nature: Justice versus Power’ in: Arnold Davidson, Foucault and his Interlocutors, 1997, p. 144. 3. Allott et al., The Responsibility of Intellectuals …, 2019, p. 98. 4. Louis Smullin, ‘Jerome Bert Wiesner, 1915-1994’, National Academy of Sciences Biographical Memoirs, vol.78, 2000, p. 9. 5. Daniel Lang, ‘Profiles, a Scientist’s Advice - 1’, New Yorker, 19 January 1963, pp. 40, 45-6. 6. Max Rosenberg, Plans and Policies for the Ballistic Missile Initial Operational Capability, 1960, pp. iii-iv, 6-7, 17, 22; David Snead, ‘Eisenhower and the Gaither Report: The Influence of a Committee of Experts on National Security Policy in the Late 1950s’, PhD thesis, University of Virginia, 1997, pp. 59-60, 79, 153, 196, 205. Wiesner’s New York Times obituary says that he ‘argued fervently for developing and manufacturing ballistic missiles.’ Eric Pace, ‘Jerome B. Wiesner, President of MIT, is Dead at 79’, New York Times, 23 October 1994. 7. Jerome Wiesner, ‘Prof. Wiesner Explains’, Chicago Tribune, 29 June 1969, p. 24. 8. Snead, ‘Eisenhower and the Gaither Report’, 1997, pp. 188-9. 9. Donald Brennan, ABM, Yes or No? 1969, p. 33. In 1958, Wiesner publicly promoted the concept of a ‘missile gap’ – if not the exact phrase – when he told a national television audience that the Soviets ‘are ahead of us in the missile field’. Snead, Eisenhower and the Gaither Report, 1997, p. 183. 10. Jerome Wiesner, Report to the President-Elect of the Ad Hoc Committee on Space, 10 January 1961 (https://www.hq.nasa.gov/office/pao/History/report61.html). 11. ‘Noam Chomsky interviewed by Jerry Brown’, SPIN Magazine, vol.9, no.5, August 1993. Wiesner’s criticisms of US nuclear policy were hardly motivated by principled anti-militarism. Rather, he believed that an overemphasis on nuclear weapons distracted the US from building what he called the ‘truly effective conventional army’ required to ‘protect the oil fields’ of the Middle East (‘The Level of Might that’s Right: An interview with Jerome B. Wiesner’, Technology Review, vol.83, no.3, January 1981, pp. 59-62). His concerns about nuclear proliferation were equally disingenuous. So, when, in the 1970s, the Shah of Iran wanted to develop nuclear weapons, Wiesner was happy to do a deal with him – a deal which Chomsky himself summed up as MIT ‘leasing’ the university’s ‘nuclear engineering department to the Shah’. Farah Stockman, ‘Iran’s Nuclear Vision Initially Glimpsed at Institute’, The Tech, vol.127, no.11, 13 March 2007; Abbas Milani, ‘The Shah’s Atomic Dreams’, Foreign Policy, 29 December 2010. In each phase of the [Vietnam] war, MIT’s contributions have become progressively more important, until now MIT-based technology dominates the air war, and in some cases makes it possible. Failure to put a stop to MIT’s work in the past has made possible the air war and social redesigning (i.e. genocide) in Indochina today. The Pentagon Papers, Gravel Edition, Vol.4, 1972, p. 122; Wells Eddleman, ‘Commentary: MIT may be Dangerous to the World’, The Tech, vol.92, no.21, 28 April 1972, p. 5. 14. Fredric Branfman, ‘Beyond the Pentagon Papers: The Pathology of Power’ in: Noam Chomsky and Howard Zinn (eds), The Pentagon Papers, Critical Essays, Vol.5, 1972, p. 303. See also: Ann Finkbeiner, The Jasons: The secret history of science’s post-war elite, 2007, pp. 65-66, 75-76; Sarah Bridger, Scientists at War: The Ethics of Cold War Weapons Research, 2015, ch.5. MITRE was devoting almost one-quarter of its total resources to the command, control, and communications systems necessary to the conduct of that conflict. Robert Meisel and John Jacobs, MITRE: The First Twenty Years, A History of the MITRE Corporation (1958-1978), 1979, pp. 114-5. 16. Walter Munk, et al., ‘Gordon James Fraser Macdonald’, National Academy of Sciences Biographical Memoirs, vol.84, 2004, p. 242; Meisel and Jacobs, MITRE: The First Twenty Years, 1979, p. 266. 17. Allott et al., The Responsibility of Intellectuals …, 2019, p. 93; Nathaniel Rich, ‘Losing Earth: The Decade We Almost Stopped Climate Change’, New York Times, 1 August 2018. 18. Gordon MacDonald, ‘How to Wreck the Environment’ in: Nigel Calder (ed. ), Unless Peace Comes; A scientific forecast of new weapons, 1968, p. 182, 191; Gordon Macdonald, Oral History Interview, no.3, American Institute of Physics, 21 March 1994. Macdonald not only investigated the use of ‘weather modification’ in Vietnam but also the use of chemical and nuclear weapons in that terrible conflict. Gregg Herken, Cardinal Choices; Presidential science advisers from the atomic bomb to SDI, 1992, pp. 158-9; Macdonald, Oral History Interview, no.3, 1994. 19. ‘Nomination of John M Deutch’, Hearings before the Select Committee on Intelligence of the US Senate, 1995, p. 110; Daniel Glenn, ‘MIT research heavily dependent on defense department funding: A Crack in the Dome’, The Tech, vol.109, no.7, 28 February 1989, p. 2. 20. Allott et al., The Responsibility of Intellectuals …, 2019, p. 97. 21. Thomas Huang, ‘Examining John Deutch’s Pentagon connections’ and ‘ABS, Chemistry Faculty did Bio-Warfare Research’, The Tech, vol.108, no.26, 27 May 1988, pp. 2, 11. In our Responsibility of Intellectuals book, Chomsky discusses the Clinton-era military doctrine that the US should portray itself as a country that ‘may become irrational and vindictive if its vital interests are attacked’. What Noam doesn’t mention, however, is that this doctrine was developed while his MIT colleague, John Deutch, was Deputy Defense Secretary and that it is likely that Deutch had significant input into the policy. Allott et al., The Responsibility of Intellectuals …, 2019, pp. 84-5. 22. David Dickson, ‘Chemical Warfare Protest Plans’, Nature, vol.295, 18 February 1982, p. 545. 23. Noam Chomsky, ‘Video interview for MIT 150 Infinite History Project’, 2009 (https://archive.org/details/NoamChomsky-InfiniteHistoryProject-2009/). 24. US House of Representatives, Research on Mechanical Translation, Report of the Committee on Science and Astronautics, 1960, pp. 6-7, 10-11. 25. US House of Representatives, Research on Mechanical Translation, Report of the Committee on Science and Astronautics, 1960, pp. 6-7, 10-11. By 1968, the US Air Force were mechanically translating around 100,000 words of Russian every day. Sergei Perschke, ‘Machine Translation – the second phase of development’, Endeavour, vol.27, 1968, p. 97-9. See also: Michael Gordin, ‘The Dostoevsky Machine in Georgetown: Scientific translation in the Cold War’, Annals of Science, vol.73, no.2, 2016, pp. 208-23, and Janet Nielsen, ‘Private Knowledge, Public Tensions: Theory commitment in postwar American linguistics’, PhD thesis, University of Toronto, 2010, pp. 39-42, 194, 338. 26. Allott et al., The Responsibility of Intellectuals …, 2019, pp. 97-9. 28. Allott et al., The Responsibility of Intellectuals …, 2019, p. 94. Life today is dominated by computers, the Internet and other by-products of post-war military research spending. It is therefore easy to be persuaded by Noam’s argument that this spending was primarily intended to develop ‘today’s high-tech economy’. But, of course, many other technologies – such as for example, low-pollution energy sources – were never fully developed although they could have made an equally important contribution to ‘today’s high-tech economy’. One obvious reason for this discrepancy is that low-pollution energy sources have no clear military use, whereas computers, the early Internet and – for a while – Chomsky’s linguistics were considered militarily useful. 29. Frederick Newmeyer, The Politics of Linguistics , 1986, pp. 85-6. We don’t support broad research programs … which have little direct and apparent mission applicability to the Air Force. Stanton Glantz and Norm Albers, ‘Department of Defense R&D in the University’, Science, vol.186, no.4165, 22 November 1974, pp. 706, 710-11; Stanton Glantz, et al., DOD Sponsored Research at Stanford: Its impact on the university, Vol. 1, ‘The Perceptions: The investigator’s and the sponsor’s’, 1971, SWOPSI, p. 7. 31. Glantz and Albers, ‘Department of Defense R&D in the University’, Science, 1974, p. 707. 32. ‘Chomsky’s Carburetor’, Cited Podcast, 2016. 33. Anthony Debons, ‘Command and Control: Technology and social impact’, Advances in Computers, vol.11, 1971, p. 354. 34. Claude Baum, The System Builders: The story of SDC, 1981, pp. 53-7, 71-7; Joel Isaac and Duncan Bell (eds), Uncertain Empire: American history and the idea of the Cold War, 2012, pp. 285-6. 35. C. Baum (ed. ), ‘Natural-Language Processing’, Research Directorate Report, SDC, January 1964, pp. 7-8, 91. 36. Charles Bourne and Trudi Bellardo Hahn, A History of Online Information Systems, 1963-1976, 2003, pp. 17, 20, 43. See also: C. Baum, Research and Technology Division Report for 1966, SDC, January 1967, pp. 11-14 . 37. Arnold Zwicky, ‘Grammars of Number Theory: Some Examples’, Working Paper W-6671, MITRE Corporation, 1963, Foreword, last page; Arnold Zwicky and Stephen Isard, ‘Some Aspects of Tree Theory’, Working Paper W-6674, MITRE Corporation, 1963, Foreword, last page. 38. Allen Newell, ‘The Trip Towards Flexibility: An ongoing case of interaction between the behavioral and computer sciences’ in: George Bugliarello, Bioengineering: An engineering view, 1968, p. 271. 39. ‘Putting the World on a Blackboard’, Boston Globe, 2 June, 4 August, 25 August 1963, pp. A-9 to A-10; ‘Space Command and Control System’, New York Times, 4 August 1963, p. 117. 40. ‘How Much do you Know about MITRE?’, Technology Review, vol.64, no.4, February 1962, p. 36. 41. ‘Systems Men: Contact MITRE’, Boston Globe, 10, 17 and 31 March, 1963, pp. A-9 to A-12. See also: Meisel and Jacobs, MITRE: The First Twenty Years, 1979, especially pages: xiii, 18-9, 59, 65, 114-5. 42. Zwicky, ‘Grammars of Number Theory: Some Examples’, MITRE, 1963, Foreword, last page; Zwicky and Isard, ‘Some Aspects of Tree Theory’, MITRE, 1963, Foreword, last page. 43. Rebecca Slayton, Arguments that Count: Physics, Computing and Missile Defense, 1949-2012, 2013, pp. 47, 55-6, 156; Security Resources Panel, Deterrence and Survival in the Nuclear Age [Gaither Report], 1957, pp. v, 6-10, 27-30; Jerome Wiesner, Warning and Defense in the Missile Age, 1959 (https://nsarchive2.gwu.edu/NSAEBB/NSAEBB43/doc2.pdf); Howard Murphy, The Early History of the MITRE Corporation: Its background, inception, and first five years, Vol.1, 1972, pp. 180-1, 199, ch.7. 44. Kathyrn O’Neill, ‘Scientific Reunion Commemorates 50 years of Linguistics at MIT’, 2011 (https://shass.mit.edu/news/news-2011-scientific-reunion-commemorates-50-years-linguistics-mit); Antonio Zampolli, et al., Current Issues in Computational Linguistics: In Honor of Don Walker, 30 June 1994, pp. xxi-xxii. 45. Samuel Jay Keyser, ‘Linguistic Theory and System Design’ in: Information System Sciences, Joseph Spiegel and Donald Walker (eds), 1965, MITRE Corporation, pp. 495-505. 46. Another of Chomsky’s colleagues who worked for MITRE was G. Hubert Matthews. It is worth noting that, in his response to me, Chomsky is keen to mention Matthew’s work on Amerindian languages while omitting to mention his involvement with MITRE. It is also worth noting that Noam’s closest colleague at MIT, Morris Halle, ran an Air Force sponsored project to develop Chomsky’s theories for ‘computer control’ – a project with apparent connections to this MITRE work. Allott et al., The Responsibility of Intellectuals …, 2019, p. 95; Keyser, ‘The Case for Ordinary English’, System Engineering, 1963, pp. 20-1; Current Research and Development in Scientific Documentation, No. 14, 1966, pp. 111. 47. Samuel Jay Keyser, ‘The Case for Ordinary English’, System Engineering: an intensive course for engineers and scientists, 1963, pp. 5, 13, 19-21. 48. Samuel Jay Keyser, Mens et Mania: the MIT nobody knows, p.8. 49. ‘Chomsky’s students recall their time at the MITRE Corporation’, February 2018 (http://scienceandrevolution.org/blog/2018/2/17/chomskys-students-recall-their-time-at-the-mitre-corporation). 50. Current Research and Development in Scientific Documentation, No. 10, 1962, pp. 301-2. 51. The MITRE Corporation, Research and Experimentation, 1960-1964, January 1966, p. 90. 52. Current Research and Development in Scientific Documentation, No. 14, 1966, pp. 111-2. 53. ‘Chomsky’s students recall their time at the MITRE Corporation,’ 2018. 54. Barbara Partee, ‘Reflections of a Formal Semanticist as of February 2005’ (https://people.umass.edu/partee/docs/BHP_Essay_Feb05.pdf), p. 8n. 55. ‘Chomsky’s students recall their time at the MITRE Corporation,’ 2018. 56. ‘Chomsky’s students recall their time at the MITRE Corporation,’ 2018. Colm Renehan, ‘Peace Activism at the Massachusetts Institute of Technology from 1975 to 2001: A case study’, PhD thesis, Boston College, 2007, p. 247. 57. ‘Now at the MITRE Corporation’, Boston Globe, 4 November 1962, p. A-18. See also: Meisel and Jacobs, MITRE: The First Twenty Years, 1979, p. 101. 58. James Killian, Sputnik, Scientists, and Eisenhower: A memoir of the first special assistant to the President on science and technology, 1977, p. 59. 59. Daniel Kevles, The Physicists, 2013, p. 404; Jerome Wiesner, ‘Thinking Ahead with … Jerome Wiesner’, International Science and Technology, no.2, February 1962, pp. 28-33; Engineering in Biology and Medicine Training Committee, Status of Research in Biomedical Engineering, 1968, p. 69. 60. White and Hauck, ‘Afterword …’, Campus Inc.., 2000, pp. 445-6. 61. Allott et al., The Responsibility of Intellectuals …, 2019, p. 97. 62. MIT was always more interested in its researchers’ contributions to military science than in their political views. This was particularly evident during Senator McCarthy’s purges of the 1950s. A former MIT provost, Walter Rosenblith, recalls with some pride that when McCarthy’s envoys came to the ‘tower of war research’ that is MIT, the university’s president, James Killian, ‘showed them the door’. ‘Online Oral History Interview: Walter A. Rosenblith’, 19 July 2000, (https://libraries.mit.edu/_archives/oral-history-transcripts/rosenblith-pdf/rosenblith-session%202.pdf) pp. 20-2. 63. Allott et al., The Responsibility of Intellectuals …, 2019, p. 101, note 36. 64. Michael Feirtag, ‘Battering Ram III’, The Tech, vol.91, no.55, 14 December 1971, p. 8; Bruce Schwartz, ‘Kats, Bohmer, Mom Jailed’, The Tech, vol.90, no.28, 22 May 1970, p. 1. 65. Curtis Reeves, ‘19 Appeal Trespass Cases’, The Tech, vol.92, no.28, 4 August 1972, pp. 1, 13. 66. ‘A Faculty Petition in Support of the ROTC Occupation’, The Tech, vol.92, no.27, 19 May 1972, p. 3. 67. Noam Chomsky, ‘Video interview for MIT 150 Infinite History Project’, 2009 (https://archive.org/details/NoamChomsky-InfiniteHistoryProject-2009/). 68. Joel Segel, Recountings: Conversations with MIT mathematicians, 2009, pp. 206-7. 69. Allott et al., The Responsibility of Intellectuals …, 2019, pp. 96, 115-6; Robert Barsky, Noam Chomsky, a life of dissent, 1997, p. 140. 70. Dorothy Nelkin, The University and Military Research, 1972, pp. 81-2; Eugene Skolnikoff, ‘Video Interview for MIT 150 Infinite History Project’, 2011 (https://infinitehistory.mit.edu/video/eugene-b-skolnikoff-’50-sm-’50-phd-’65). See also: Noam Chomsky, MIT Review Panel on Special Laboratories, Final Report, October 1969, pp. 17, 31. 71. MIT Review Panel on Special Laboratories, Final Report, October 1969, pp. 37-8. MIT’s leading student activists at this time, Michael Albert, has since described Noam’s position as, in effect, ‘preserving war research with modest amendments.’ Michael Albert, Remembering Tomorrow: From the politics of opposition to what we are for, 2006, p. 98. 72. Stephen Shalom, ‘A Flawed Political Biography’, New Politics, vol.6(3), no.23, summer 1997. 73. Allott et al., The Responsibility of Intellectuals …, 2019, p. 115. 74. Allott et al., The Responsibility of Intellectuals …, 2019, p. 116. MIT is so deeply involved in work relating to weapons systems that they have to resort to some sort of sophistry to justify it. If you’re going to do defense research, you should do it as well as you can. At MIT we can do it very, very well. Robert Levey, ‘MIT Role in Research and Military Questioned: Classified Work is Done at Off-Campus Labs’, Boston Globe, 7 August 1983, pp. 1, 16. 76. James Hand (ed. ), MIT’s Role in Project Apollo, vol.1, October 1971, p. 5. MIT’s president in the 1980s, Paul Gray, has clearly stated that, during the 1960s, the university’s military labs were ‘an integral part of MIT’. Jerome Wiesner, Jerry Wiesner: Scientist, statesman, humanist: memories and memoirs, 2003, p. 109. 77. MIT Review Panel on Special Laboratories, 1969, pp. 59-69. 78. Chomsky, ‘Video Interview for MIT 150 Infinite History Project’, 2009; Noam Chomsky, ‘Interview with Noam Chomsky’, Works and Days, vol.26-7, 2008-9, pp. 530-34. Chomsky has continued to contradict himself on the issue of whether MIT’s military labs were integrated with the university’s academic activities. For example, in his 2019 response to me, Chomsky clearly stated that MIT’s military labs were ‘entirely separate from the academic program’. Yet in an earlier response, in 2017, he stated that there would have been no point in separating MIT’s military labs from the university because they ‘would continue their work as before, also effectively maintaining relations with academic programmes.’ Allott et al., The Responsibility of Intellectuals …, 2019, p. 96; Noam Chomsky, ‘Chomsky Says’, London Review of Books, vol.39, no.12, 15 June 2017. 79. Milan Rai, Chomsky’s Politics, 1995, p. 130. 80. Allott et al., The Responsibility of Intellectuals …, 2019, p. 93. 81. Noam Chomsky, ‘Chomsky Says’ and ‘Chomsky has the Last Say’, London Review of Books, vol.39, no.12, 15 June 2017 and no.16, 17 August 2017; Allott et al., The Responsibility of Intellectuals …, 2019, p. 91-2. 82. Allott et al., The Responsibility of Intellectuals …, 2019, p. 101, 96-9 . 83. Mark Liberman, ‘Morris Halle: an appreciation’, Annual Review of Linguistics, vol.2 no.1, January 2016, p. 8. 84. Barsky, 1997, p. 54, 81; Chris Knight, Decoding Chomsky: Science and revolutionary and politics, p. 60. 85. Chris Knight, Decoding Chomsky: Science and revolutionary and politics, p. 56. 86. Noam Chomsky, Morphophonemics of Modern Hebrew (Reprint of PhD thesis, 1951), 1979; Noam Chomsky and Morris Halle, The Sound Pattern of English, 1968. 87. Noam Chomsky, ‘Language and Mind: Current Thoughts on Ancient Problems’ in Lyle Jenkins (ed. ), Variation and Universals in Biolinguistics, 2004, p. 405. 88. Noam Chomsky, Language and Problems of Knowledge: The Managua Lectures, 1988, p. 2; Denis Staunton, ‘Iconoclast and radical who takes a long view‘, Irish Times, 21 January 2006. 89. For more on my approach to Chomsky’s linguistics, see the Open Democracy debate involving myself, Fritz Newmeyer, Randy Allen Harris, Wolfgang Sperlich and others HERE. 90. Noam Chomsky, On Nature and Language, 2002, p. 76. 91. Adele Goldberg, Explain Me This. Creativity, competition, and the partial productivity of constructions, 2019, p. 145. 92. Chomsky, ‘Three factors in language design’, Linguistic Inquiry, vol.36, no.1, 2005, pp. 11-12. Furthermore, there is good reason to suppose that the argument is at least in substantial measure correct even for such words as carburetor and bureaucrat. … However surprising the conclusion may be that nature has provided us with an innate stock of concepts, and that the child’s task is to discover their labels, the empirical facts appear to leave open few other possibilities. Noam Chomsky, New Horizons in the Study of Language and Mind, 2010, pp. 64-6; Noam Chomsky, The Architecture of Language, 2000, p. 75. 94. This point has been conceded by Chomsky himself, but if readers require further evidence, they can turn to the work of Christina Behme, Margaret Boden, Cedric Boeckx, Rudolf Botha, Daniel Everett, Vyvyan Evans or Michael Tomasello. These days, the theoretical approach developed by Adele Goldberg and her colleagues – known as ‘construction grammar’ – is considerably more influential and widely admired within the discipline of linguistics than Chomsky’s so-called ‘generative’ approach. Noam Chomsky, On Nature and Language, 2002, p. 151; Christina Behme, ‘A “Galilean” science of language’, Journal of Linguistics, vol.50, no.3, November 2014; Margaret Boden, Mind as Machine: A history of cognitive science, 2006; Cedric Boeckx, 2017, ‘Not only us’, Inference, vol.3, no.1; Rudolph Botha, Challenging Chomsky: The generative garden game, 1989; Daniel Everett, Language, the Cultural Tool, 2012; Vyvyan Evans, The Language Myth: Why language is not an instinct, 2014; Michael Tomasello and Paul Ibbotson, ‘Evidence Rebuts Chomsky’s Theory of Language Learning’, Scientific American, November 2016; Adele Goldberg, Constructions at Work: The Nature of Generalization in Language, 2006. See also: Chris Knight, Decoding Chomsky: Science and revolutionary and politics, 2016, pp. 150-6, 162-8. 95. Kenneth Hale, 'On the position of Warlpiri in a typology of the base', Indiana University Linguistics Club, 1981. See also: Kenneth Hale, 'Warlpiri and the grammar of non-configurational languages', Natural Language and Linguistic Theory, Vol.1, 1983, pp. 5-47; Kenneth Hale, 'On Nonconfigurational Structures' in: Laszlo Maracz and Pieter Muysken, Configurationality: The typology of asymmetries, 1989. 96. Hale, 'Warlpiri and the grammar...', 1986; Hale, 'On Nonconfigurational Structures...', 1986, p. 352. 97. Noam Chomsky, Lectures on Government and Binding, 1981. 98. Kenneth Hale, 'Warlpiri and the grammar of non-configurational languages', Natural Language and Linguistic Theory, vol.1, 1983, pp. 5-47. See also Kenneth Hale, 'On nonconfigurational structures', 1989. 99. David Golumbia, 'The interpretation of nonconfigurationality', Language and Communication, vol.24, 1-22. 100. Noam Chomsky, The Minimalist Program Cambridge, 1995. 101. Robert Berwick and Noam Chomsky, 'The biolinguistics programme: the current state of its development', in: Anna Maria Di Sculio and Cedric Boeckx, The Biolinguistic Enterprise: New Perspectives on the Evolution and Nature of the Human Language Faculty; Noam Chomsky, 'Of minds and language', Biolinguistics, vol.1, 2007, pp. 9-27. 102. Noam Chomsky, The Science of Language: Interviews with James McGilvray, p. 41. 103. Tomasello and Ibbotson, 'Evidence Rebuts Chomsky's Theory of Language Learning', Scientific American, 2016. 104. Richard Lee (ed. ), The Cambridge Encyclopaedia of Hunters and Gatherers, 1999. 105. Chris Knight, 'Language and revolutionary consciousness' in: Alison Wray, The Transition to Language, pp. 138-60; Chris Knight and Jerome Lewis, 'Vocal deception, laughter, and the linguistic significance of reverse dominance' in: Dan Dor, Chris Knight and Jerome Lewis, The Social Origins of Language, 2014, pp. 297-314. 106. Dor, Knight and Lewis, The Social Origins of Language, 2014, pp. 228-46; Chris Knight and Jerome Lewis, 'Wild voices: Mimicry, Reversal, Metaphor and the Emergence of Language', Current Anthropology, 2017, vol.58, no.4, pp. 435-53. 107. Adam Jones, 'The Radical Vocation: An Interview with Noam Chomsky', 1990.